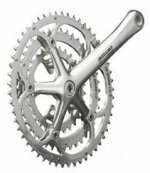 The Campagnolo Chorus Chainsets come in 10 and 11 speed, standard and carbon versions, double and triple. The UT stands for the Ultra Torque system - a development to maximize the drivetrain stiffness without sacrificing either bottom bracket drag or Q-Factor. Chorus cranks are available in compact or double, 170mm, 172.5mm, and 175mm and require the use of a Record Ultra Torque bottom bracket. The Chorus 11 features: Unidirectional and multidirectional carbon fibre, Long life anodisation treatment, Sectors with special ESP profile on the outermost chainring, Light alloy screws, Utra-Torque bottom bracket.